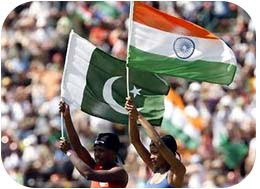 Its yet another head on clash this weekend between two arch rivals India & Pakistan in the Champions trophy. No doubt... its always one of the most awaited matches in the sub-continent...!! The heat is on and both the teams will be giving a tough fight...! The Pakistan Perspective: A truly competitive side ranking 4th in the ICC teams ranking. Not in a good form though but has a lot of potential. In fact, the last match against West Indies was made complicated with the strewn performance of the team. A low scoring match that was equally made tougher especially by the Pakistani players..! Unlike match one, Captain Younis Khan is now fit to take up the captaincy once again and is very keen about this encounter. With Afridi and Malik in form, the budding Umar Akmal is an added strength to the team. On the whole a precise package, eying the mini World Cup...!! To know more about the Pakistan Squad, visit www.cricinfo.com. The Indian Perspective: Mr. Cool leading the in form team who is now ruling the ICC ranking at spot # 1. Unfortunately... Yuvi is ruled out of the entire series which adds to the problem caused by Sehwag's absence. But overall the team looks in good shape and has been doing well over the recent past. The victory in the Compaq Cup has lifted the spirits even further. Of late... both our vetrans i.e. Master Blaster and the Great Wall have shown good form adding power with experience in the team. Overall... a well chosen team even without Yuvi, Sehwag and Zaheer.. To know more about the Indian Squad, visit www.cricinfo.com. The bet: My bet is definitely on India. 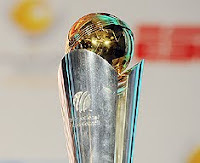 Moreover I see a 70-30 chance for India to even get hold of the Mini World Cup...!! India could not keep up the hopes... n lost by 54 runs...!! I hope it picks up the momentum from the next match!!! M S Dhoni's Indian Team has not done well in big tournaments since the inagural T20 win in RSA. They failed in the following T20 world cup and now in champions trophy. Infact this team failed in Asia Cup too. They won the VB Serise in Australia due to 2 superb innings from Sachin Tendulkar (a 100 & a 90 in the two finals) and again in the 3 nations tournament in Srilanka recently where the master blaster again set it up for the team with a 100. This time Sachin failed and so did India...what's new I wonder. It is shamefull that even after so many years India are so heavily reliant on Sachin without whom India can win bilateral serise but not the big ones....it's still 'Team Sachin' not Team India...Mr.Cool (Dhoni) is the biggest hype in Indian cricket in recent years....so I am hardly surprised that India is out of the tournament now. I will be surprised if India actually manages to win the World Cup in 2011. If it does, it will be due to the brilliance of player's like Sachin, Yuvi, Gambhir etc. But problem is Mr.Dhoni's good luck seems to be running out.....perhaps the only thing he had....! !